Lidia Correia dos Santos is a 24-year-old health care worker from Bidau Massau, Dili and is the first MBM scholarship recipient for 2015. After graduating high school, Lidia began work at the Bairo Pite Clinic and has been working to treat malnourishment for the past three years. In her capacity as a health care provider she works closely with mothers and their children, assessing the condition of each child and ensuring that their daily nutrition requirements are met. She also provides outpatient care and educates parents about good nutrition. 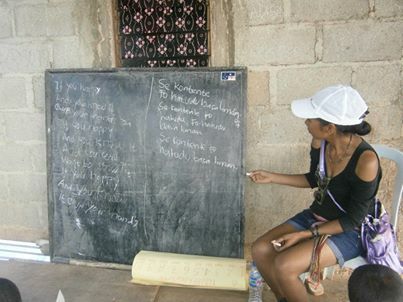 Lidia became interested in the Matadalan Ba Malu program as she was looking for opportunities to improve her English. By developing her skills she hopes to be able to study in an English speaking country so that she can return to Dili and benefit the operations of the Bairo Pite clinic. Meet Teresa Pereira and Luisa Marcal, Matadalan Ba Malu 2014 scholarship recipients. Supported by RMIT English Worldwide and The Centre for Global Research the scholarships are allocated to proactive female leaders from Timor-Leste who are driven to develop skills that will better enable them to support their community. Participants are provided with an intensive learning opportunity that combines high quality English training and the experience of cross cultural exchange here in Melbourne, Australia. Both recipients this year play seniors roles in organisations that support vulnerable and disadvantaged women back in Timor-Leste and are very passionate about what they do. Teresa and Luisa feel the skills they will gain from the program will build their confidence in communicating in both English and in cross cultural contexts. This they suggest is important as they can be more competitive in grant applications, dealing with stakeholders, facilitating and negotiating local development activities and identifying further opportunities and support for their organisations and communities. Both women have been studying diligently since arriving in Melbourne and are finding the experience both challenging and rewarding. We have no doubt they will take back home with them new found confidence and skill to continue on with their inspirational efforts. Teresa (pictured right) is the founding Director of Centru Feto Haburas Dezenvolvimento (CFHD) in Baucau, Timor Leste and the proud mother of three boys. Teresa established her organisation in 2011, opening her doors to vulnerable women in the Baucau district as both a refuge and a place for them to access opportunities to improve their lives. Teresa was inspired to open the centre after seeing women in her community being denied opportunities and falling victim to violence. Through her work she hopes to change the mindset of her community by encouraging all to be more supportive and inclusive of women. Luisa (pictured left) is a mother, grandmother, qualified midwife and a founding member of PRADET (Psychosocial Recovery and Development in East Timor) whom provide psychosocial support for people who have experienced trauma, mental illness and other psychosocial problems in Timor-Leste. She has been responsible for coordinating PRADET's programs in three districts across Timor-Leste and since 2002 established and manages Fatin Hakmatek (Safe House) to support victims of domestic violence through treatment, counselling, rehabilitation, assistance with judicial processes and legal issues. Luisa has played a vital role in the development of PRADET and its support of vulnerable women across Timor-Leste. On 10 April 2014 both Teresa and Luisa participated in a panel discussion at RMIT University on Domestic Violence in Timor-Leste, and their powerpoints can be downloaded by clicking on the top two photos below. As a country that is still very much suffering the effects of war and acute poverty, women who participate in this program see it as a unique opportunity to be able to make a significant change in the communities in which they work and live. For instance, Aguida works in the rural mountainous area of Ainaro and works both as part of the government but also various community schemes. For Juvita, whose ambition it is to enter the legal profession to become a judge in East Timor, the experience in Australia taught her a great deal in terms of understanding the steps she needs to take in order to fulfil her ambitions, as well as developing her language skills as will be required for her future work. All three women described deriving personal and professional benefit from the scholarship opportunity offered through RMIT English Worldwide, as well as how they have taken the English lessons and approach to education back to their communities. The women have all stayed in contact with MBM since and have helped provide advice and ideas for the programs future development. I was really happy with this course because the system of teaching was excellent and very clear I also learnt much about how to communicate with respect in Australian culture, which is very important for me as I work with Australians and other foreigners in Timor-Leste. Some of the topics taught by the teachers also have a direct link to my professional life (I work as a researcher), for example how to undertake timelines and write CVs. To this day I still feel like I am benefiting from my time with REW. I am now able to produce written material of a proper standard and have developed new strategies to continue to improve my English language skill which has extended my skills in interviewing international staff, analysis and report writing, all essential skills for my current position as Acting CEO of the Fundasaun Alola. The opportunity that I got from REW – RMIT has enabled me to extend my spoken English skills and improve my written English skills. Particularly in Pre-Intermediate level, I learnt about English for academic purpose, which was focus in increasing my writing structure. On July 2008 I had an opportunity from RMIT to attended an English Course in RMIT University for 5 weeks. I was really excited about studying in RMIT because the Education system is well organized and all of the teachers are very kind and helpful. Writing and Speaking is the most interesting subject for me, because it is important for me to communicate with other people especially foreigner. In February up to the beginning March 2007, I had an opportunity studied English at RMIT University for five weeks. My understanding of this course is most valuable for the new development country. Because through this opportunity young people could increase their knowledge and good experience which they’ve got from outside country for the bright future of East Timor when they are coming back. Even though, just for short term English study I hope there is still have much opportunity to others Timorese people to take part of it. I would like to say thank you very much for the opportunity that you gave me in 2007, to do an English course at RMIT University in Melbourne, Australia. I am very happy because now I can use that language to speak with people in other countries. So it was very-very helpful.